Allison Siebecker, ND, MSOM, LAc, graduated with a Doctorate in Naturopathic Medicine and a Masters in Oriental Medicine from the National University of Natural Medicine. She is the co-founder and former medical director of the SIBO Center for Digestive Health at NUNM Clinic and has specialized in the treatment of SIBO since 2010. 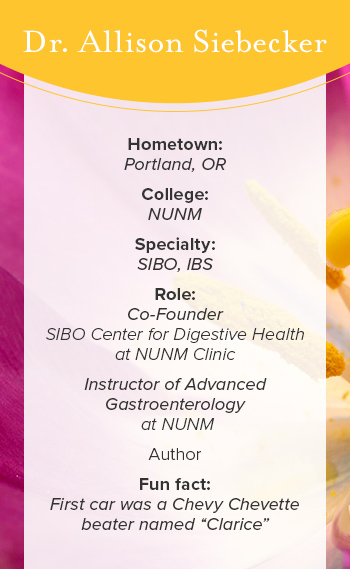 She is the Instructor of Advanced Gastroenterology at her alma mater, IBS Board of Advisor, Faculty for the GI Health Foundation, Co-Founder and Curriculum Coordinator of the 2014-2016 SIBO Symposiums, teaches continuing education classes for physicians, and is the author of numerous articles and the free educational website siboinfo.com. Question: For the uninitiated, what is SIBO and how did you get involved in treating it? SIBO stands for small intestine bacterial overgrowth. It’s a very common disorder and one of the main underlying causes of IBS (irritable bowel syndrome.) IBS is the most common functional gastrointestinal disorder in the world. It’s a conglomeration of symptoms, and those symptoms can be caused by so many conditions that it is difficult to figure out what what’s really causing it. One of the reasons I’m so invested in working with it, is that I'm diagnosed with IBS and SIBO. I know what happens to a lot of patients is that they get a wastebasket diagnosis and then some symptomatic treatment. After my diagnosis, I went on to become a doctor, and information on SIBO was relatively new and not in our curriculum. When I first learned about SIBO, I got really excited. I had these symptoms, and the statistics showed that 60%of IBS, on average, is caused by SIBO. So it’s a majority cause, and if someone has it, it means that we can figure out what the target is and treat it, instead of just treating symptoms. I started using some of the treatments, beginning with diet, and because of this my symptoms were about 60% relieved, with abdominal pain relieved 100%. I’d had this pain since I was five years old so we are talking about 35 years with this disorder! It really fired me up because I felt this was missing information for doctors. In particular, I got excited about helping educate practitioners and doctors on the things I had learned, because a doctor can then go on to affect hundreds or thousands of people! Shortly thereafter, in 2010, I teamed up with my old gastroenterology professor, Dr. Sandberg-Lewis. He’s been my teammate on this, and, you could say, my champion. He was encouraging and supporting me from the start, saying, “You should teach this at the national convention.” I would have never even thought of that. We’ve been on a campaign of sorts, raising awareness and educating, ever since. Tell us how you addressed SIBO. There are around 8 diets that can be used for SIBO, all of which are extremely effective and can see somewhere in the 60-80% range of improvement of symptoms. There are people, like me, who get 90 or 100% relief with dietary management for SIBO. There is always great individuality in patients with any condition, but particularly here, the individuality is really extreme. That can be really frustrating, both for the practitioner and the patient. What we have to do is pick one diet and then we start modifying it. You have to be very flexible when dealing with this condition because of the individuality. Tell us about your SIBO Info website. What did you learn in that process? When I taught my first SIBO class, I gave out my email and didn’t realize what that would bring. Doctors started emailing me and I couldn’t keep up. Basically, I was working more than 40 hours per week on just answering other practitioner’s questions. The majority of people were all asking similar questions and I decided to put those answers into one place. I spent months building the site just as devotion to the subject and to my fellow practitioners. Thousands of people visit the site every day and there are thousands of people on the newsletter that I send out four times a year. I’ve learned a lot about creating boundaries when you have something public like this. People want immediate access to you. I had to make my own decisions on how I'm going to handle communication and my time. That's a really important thing for a practitioner to figure out because burnout is so high. We need to put attention on taking care of ourselves and figuring out what's not going to drive you crazy. What advice would you give for patients who have SIBO and don’t have access to these practitioners? I’ve been offering telemedicine consults via Skype for years. Even if you are in a rural area, you can get some really good help from practitioners offering virtual sessions or great information from websites dedicated to focusing on topics that affect your life. There are also conferences and summits that you can attend or watch. I’m involved with the SIBO SOS summit right now and the majority of the speakers featured there do telemedicine, so that's another way people can get familiar with these individuals. There are also a lot of Facebook groups on specific health topics, and there are many patients that are pleased with their doctor and spread the word there. Do keep in mind though, there will also be plenty of people offering advice on what to do or not to do, who are not practitioners. It’s good to hear from others and learn what’s working for them, but because so much of this is individualized, it’s critical to circle back with a practitioner, even if via a virtual session, before acting on any advice. My next career moves are to get my books published and to get my full day course online for practitioners. I may even offer some online classes just for patients. I’m always focused on education. That, in particular, really fires me up, to continue getting the information out there to the people that don't have it. We've done a great job with the naturopathic and alternative community, but the next step is reaching out to primary care MDs. Those are the people we really need to reach.